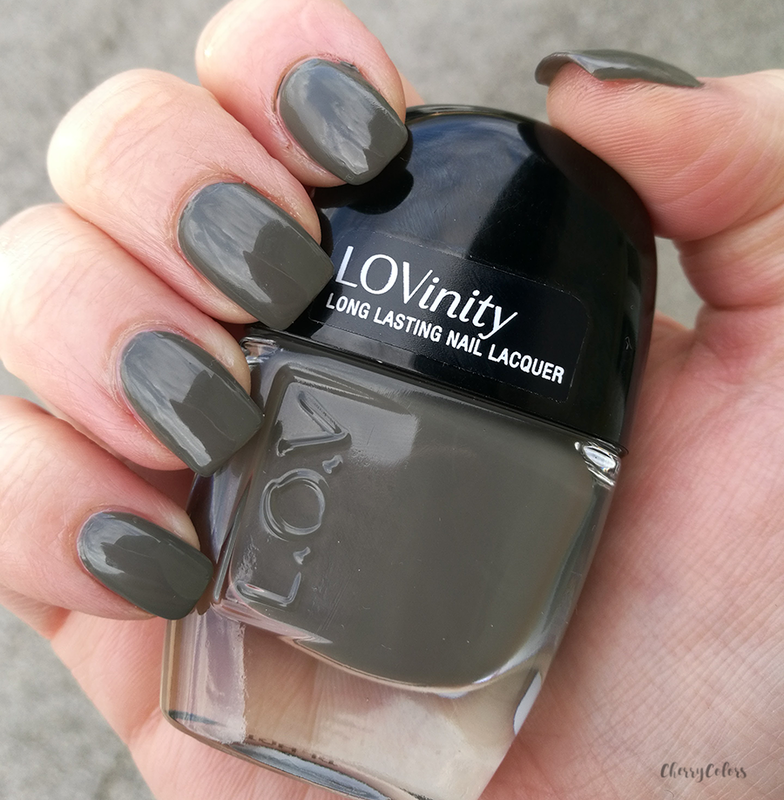 LOVinity nail polish in Olive Obsession (263) - Cherry Colors - Cosmetics Heaven! I must admit. I just got rid of a similar nail polish color (by OPI) and I was so happy about it. This color makes all the pinks in my skin visible and I'm not a fan of that. But the thing is, a day or so later, I got this nail polish on my doorstep. It's called Olive Obsession which is quite funny. I love olives (as food). Up to 7 days of vibrant nails with chip-resistant innovative polymer formula. High gloss gel-like studio finish. High-performance flat brush with innovative fibers for even application and coating. It makes a lot of promises but so far I've managed to test only two. I applied two layers but I could totally go with just one. It's very opaque and the finish is really glossy. 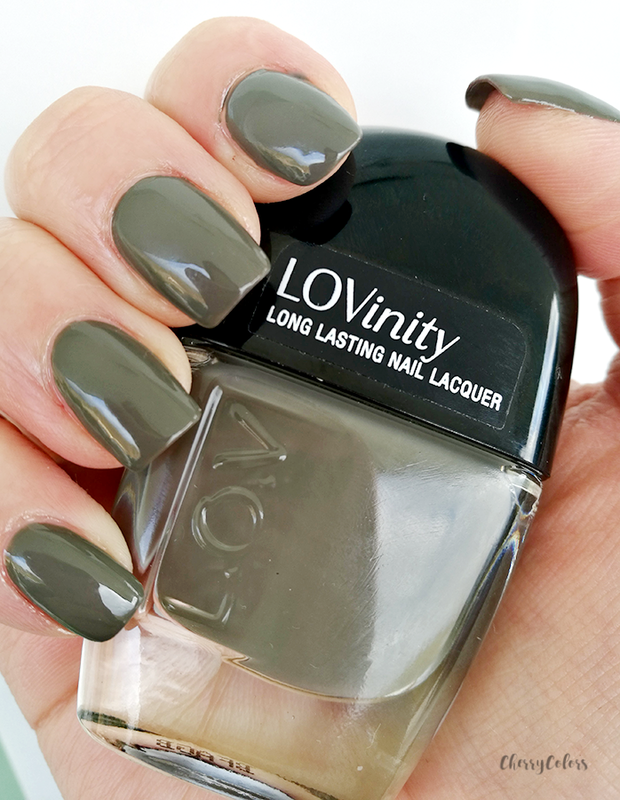 LOVinity Long Lasting Nail Lacquer is almost too good to be true. By combining innovative precision brush and long-wear formula, this nail lacquer turns nail beauty into an art form. with its professional rounded shape, each fiber works in perfect harmony with the nail lacquer formulation. One stroke, and the nail is evenly and precisely coated. Thanks to the chip-resistant high gloss texture, nails will shine on... up to 7 days. 7 days of intense and alluring nail color is more than great: it is called L.O.V. The application was a dream. I really wanted to hate it as I'm not a fan of the color, but the brush is just perfect. It has a round tip and picks the right amount of nail polish. The polish itself is more on the watery side, but not very runny. It's easily manageable. I think I'm in love with the formula. The color - not so much. But this makes me want to try some other colors as this one was just amazing (formula wise). Do you like this shade of olive green?